I have been developing a TYPO3 Flow application for some time now. 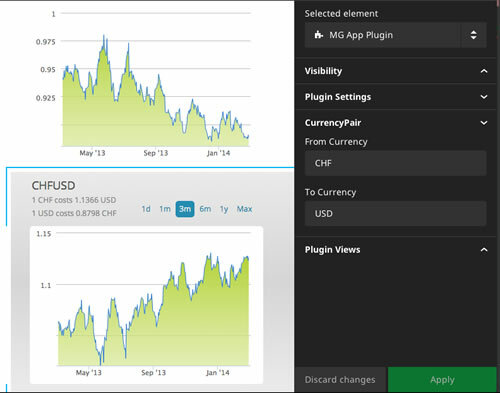 The app uses widgets for displaying financial data, e.g. stock prices and currency rates. I was curious about how to move my existing package to Neos and of course I wanted to reuse my widgets. Furthermore I wanted to give the editor the opportunity to specify stock codes or currency pairs which will be used by the widget. I will start to describe the latter variant, as it seemed to be easier to implement – and it really was quite simple! In order to create a new NodeType you need to configure it in your file Configuration/NodeTypes.yaml. The next step will be to create the HTML template for your widget. My widget’s view helper name is mg:widget.stock. Therefore I added the namespace to the top. 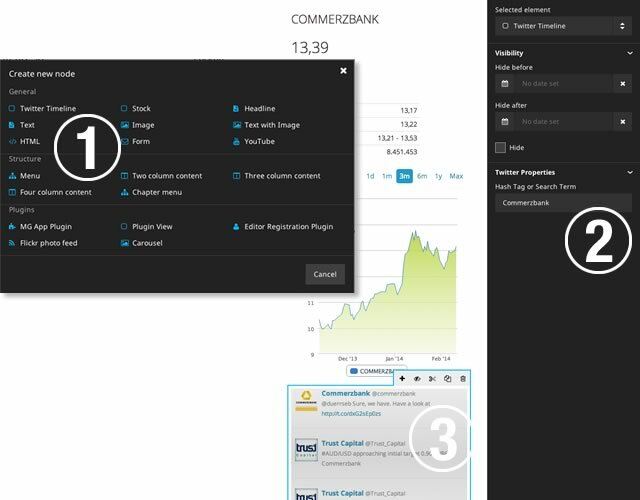 The functionality will then be implemented in my StockController. Note the annotation in the widget view helper where it says to which controller the request is being delegated ($controller). The logic is in the StockController where the stock object is being fetched from the repository and afterwards it will be assigned to the template. Note: The property ‘searchTerm’ as edited in Neos will go directly into the template. No further adjustments are necessary! The first attempt to integrate my widgets into TYPO3 Neos was to create a plugin. You can read about the basic steps here: Creating a TYPO3 Neos plugin. The only thing worth mentioning is where I asked myself ‘how do I get the property values into my template’? Add some TypoScript to tell Neos the default controller and action for your plugin. I have put my TypoScript configuration into my package’s Resources/Private/TypoScripts/Library/Plugin.ts2. We are now done and our widget will hopefully show up! It pays off when you use widgets within your Flow app or your Neos website. It’s easy to reuse your loosely coupled widgets in whichever context you like. This is a really great tutorial, thanks for posting it! Great tutorial, thanks! But i don’t get the point where you actually generate the html code? In the controller you only assign some variables, and in the template you are only triggering them with . And why is it Ajax? Isn’t it rendered by templating?